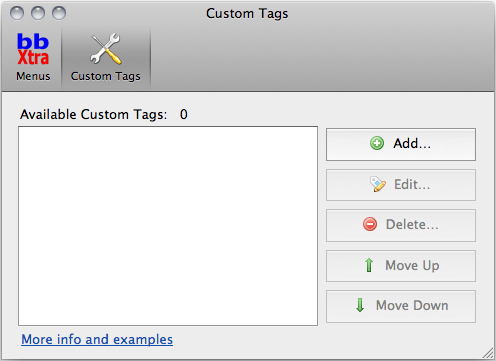 Custom tags is a feature introduced in version 0.3.0. You can manage custom tags from the Preferences window, available from the Extension Manager window of from the context menus. You can create a custom tag to insert a fixed plain text or symbols like ©, ® e ™ (both HTML entity or UTF characters). Create an XHTML img tag, assign class imagepost and use the URL saved in the clipboard as src. When you select the custom tag image clipboard, the _clipboard_ variable will be automatically replaced with the clipboard’s content. Create an XHTML link, using selected text as URL and “link” as text. When you select the custom tag link selection, the _selection_ variable will be automatically replaced with the selected text. Create an XHTML div, using the clipboard as content and selected text as class name.